My friends at St Louis Abbey posted this cheat-cheat on doing lectio divina encouraging us to dig deeply into this very necessary form of prayer. All good things are derived from the daily practice of lectio divina. As the monks will tell you, lectio is not only for monks but for the entire Church. with the Father, the Son and the Holy Spirit; it is a way of getting in touch with Jesus Christ our Lord and our brother. It is away of reading centered on God and, if you do it with faith you will be able to hear what he has to say to you here at this moment. It is a way of reading which is slow so that the words are savored in meditation. It moves from the literal meaning to what only the Spirit can make clear to you. It calls for action by your involvement and for passive surrender as it draws you into the heart of God. It is disinterested; the text must be read for its own sake and not for the achievement of having read it. Lectio is a way of experiencing Jesus Christ. You will encounter him personally in the sacred scriptures because he is there hidden in the pages of your Bible and you ought to believe in his presence with greater assurance than if you could see him with your eyes. He has the same power there as he revealed in the gospels and he cures you of your physical and moral ailments, brings his light to your everyday life and leads you to eternal life. understand what you read, then have confidence that the Lord will reveal it to you in his own time, because no word comes form the mouth of the Lord without achieving in you the work he intended. If your thoughts and imagination get in the way of your prayer, then fling them immediately before Christ. Make no attempt to master them by your own strength, but try to turn back to your prayer. speaks to you; when you pray, you speak to the word and so turn your prayer into conversation. Your prayer may be simply staying with the word in silence, or it may be a thanksgiving, or a petition, or praise, or blessing, or contrition, or intercession, or one single word on which you pause and then repeat at will, or it may be a prayer of inspiration. 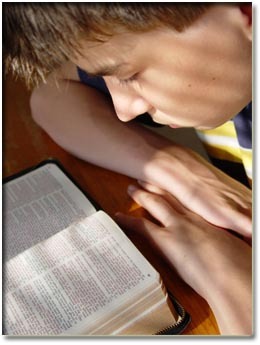 If you are taking part in shared lectio, the way to share what the scripture has said to you is by means of a personal comment spoken in the first person singular and applied to your own life, or else it may be a prayer out loud offered directly to God.